The EW-18 utility electric scooter by e-Wheels is a 3-wheel recreational innovative pre-mobility electric scooter for personal transportation. The EW-18 mobility scooter comes with a powerful 400 watt brushless hub motor, for a speed up to 15 MPH. The EW-18 STAND-N-RIDE is a simplified mobility scooter and a real work-horse with a smooth ride. 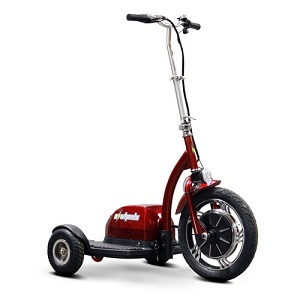 This scooter can be used in many applications including warehouse school/college campus, shopping complexes, enclosed parking garages, security officer patrols, and just about any other uses that you need silent emission free transportation residential or commercial. 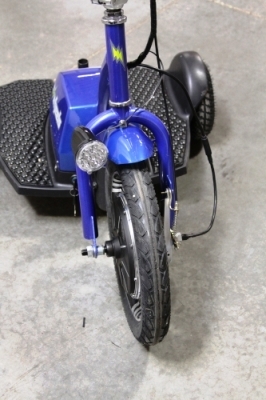 This three wheel scooter provides greater stability and safety than regular two wheeled transporters, not to mention more torque and longer range for more rigorous uses. The Ew-18 utility scooter is great for recreation or mobility use and the extra wide sturdy seat is easily removable so you can stand up or sit down while riding. The new collapsible and foldable handlebar makes it easy to store and transport. 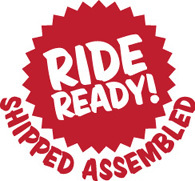 Just drop the handlebars and store it in the back of the trunk, truck, RV, van or closet. The advanced front wheel hub motor design is superior for overall performance, efficiency as well as maneuverability, with a turning-radius which allows the user to make a tight 360 degree turn. To charge the 36 Volt 10 AH Sealed lead acid batteries, just plug the 36 volt charger into any conventional 110-volt household outlet for a full charge in 4-6 hours. The eWheels EW-18 Stand-N-Ride Scooter from GoSouthernMD.com is a simplified mobility scooter work-horse with a smooth ride. This new and improved three wheel electric scooter is a top quality, stable and easily maneuverable 3-wheel scooter, designed for a variety of recreational and commercial applications. The eWheels Stand-N-Ride Scooter gives busy, able-bodied people the little bit of oomph they need to get them from place to place. This mobility scooter offers a smooth, quiet, non-intrusive device perfect for anyplace, from the mall, to park & swap, farmers market, doctor's office, warehouse applications, school/college campus, enclosed parking garages, security officers for patrol, or just about any application that you need silent (no emission) transportation. You can take it anywhere you need to go. Unlike other mobility scooters, this simplified mobility scooter capable of carrying up to 300 lbs. It is ideal for use by pre-mobility candidates as a stand-up scooter or comfortably seated on an optional scooter seat. Front Wheel Size: 16/2.125 in. Rear Wheel Size: 4/2.125 in. Weight with Batteries: 78 lbs. 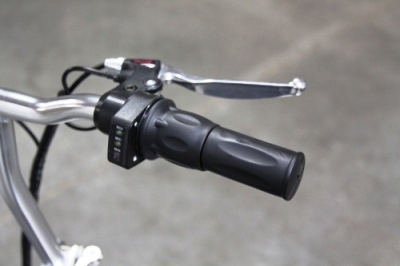 *Actual range and top speed determined by user weight, battery state/charge and terrain conditions. Warranty: Manufacturer's 6 month limited warranty. Batteries (factory-installed in an EWHEELS bike) are warranted to the original owner to be free from defects in materials and workmanship for a period of three months (90 days) from the date of purchase by the original owner. The battery warranty does not include damage from power surges, use of improper charger, improper maintenance or other such misuse, or normal wear.